Synopsis: Policemen Ali Sokhela and Brian Epkeen investigate the brutal murder of a young white woman, apparently provoked by the availability of a new illegal drug and somehow connected to the disappearance of black street children. Although Jérôme Salle’s crime thriller Zulu is based upon an award-winning novel, it feels like, prior to writing their adaptation, Salle and co-writer Julien Rappeneau drew up a checklist of genre clichés – not to help them to avoid the obvious pitfalls, however, but to ensure each was included at some point. It’s as if they believed that by combining all the component parts of every hard-bitten cop movie they could think of they could create something that would surpass them all. Unfortunately, their labours result in a film that too often doesn’t seem to know what is important and what should be left out. It sprawls, and then spreads beyond its creators’ control so that the murder mystery at its core keeps being shunted to the side-lines while we’re subjected to a surfeit of uninteresting domestic sub-plots. A too-thin Forest Whitaker (Johnny Handsome, Out of the Furnace) delivers a performance of quiet intensity as Ali Sokhela, a detective with the South African Serious and Violent Crimes Unit, whose life is overshadowed by a traumatic childhood incident. With his partner, Brian Epkeen (Orlando Bloom – The Lord of the Rings: The Fellowship of the Ring, The Lord of the Rings: The Two Towers), a pill-popping semi-alcoholic with a failed marriage and estranged teenage son, Sokhela investigates the beating to death of a young white woman. They find their investigations taking unexpected directions when the woman’s death appears to be linked to the disappearance of a number of street urchins and a new drug flooding the streets. It’s a strange one, Zulu. It’s very well made but is loaded with the kind of cliched characters and situations you’d expect to find in a much less ambitious project. Epkeen in particular is a troubling character. He’s an alcoholic, repeatedly sneaking spirits from a bottle when he thinks his colleagues aren’t looking and liberally lacing his coffee with whisky, and yet not once is his judgment impaired or his decision-making flawed. We never even see him drunk. Sokheli’s character is equally troubled, but for reasons that aren’t immediately made clear, and his psychological profile should be a prickly maze. But again, the movie shies away from intruding too deeply, leaving us with a maddeningly incomplete picture of the man. 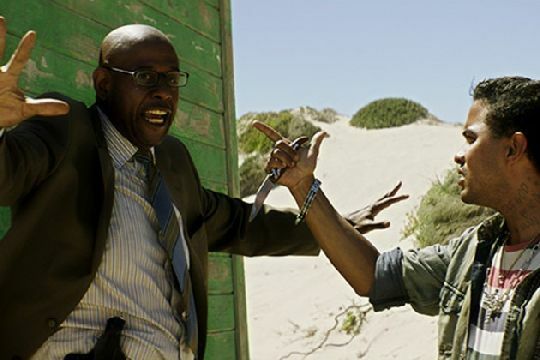 Although it’s not an action movie as such, the shoot-outs are well-staged and Zulu does create a suitably edgy feel when it’s roaming the crime-ridden slums of the townships. Salle’s direction is agreeably restrained, refraining from employing the hyper-flashy kind of look which, given the subject matter, many directors would have undoubtedly chosen; it’s just a shame he and Rappeneau were unable to demonstrate equal restraint in the writing department.